Council for Research and Development. Duration: 4 1/2 years. Council for Research and Development. Duration: 2 years. IJDSST Associate Editor of the International Journal of Decision Support Systems Technologies. IJDSST Member of the Editorial Board of the International Journal of Decision Support Systems Technologies. IJDSS Member of the Editorial Board of the International Journal of Decision Support Systems. IJASCA Member of the Editorial Board of the International Journal of Advances in Soft Computing and Its Applications. LNBIP-DSS Co-Editor of the EWG-DSS annual volume of the LNBIP Springer Lecture Notes in Business and Information Processes. Worked as an engineer at IPqM, in charge of the Computer Graphics Division of the Informatics Group. Basically, the nature of the work carried out in the Computer Graphics Division, concerned the use of CAD-CAM systems for electrical applications, involving the design and test of Printed Circuit Boards. During this time, research and development of expert systems and decision support systems were also carried out, for the defense application of electronic warfare. That research led to a Masters dissertation’s development, which concerned of an expert system applied to the specific field of electronic warfare for a naval environment. The thesis work was directed to aid the process of decision-making concerning the electronic countermeasures to be adopted, aiming at deceiving or neutralizing a threat previously identified during a military conflict. This system was implemented using OPS5 (Official Production System - V.5). From 1998 to 1990, intensively cooperated in research for two years with the Institute of Logics, Philosophy and Theory of Science in Rio. Related activities in ILTC included the research and development of multimedia systems for educational applications, using artificial intelligence techniques, as well as investigation of knowledge based systems, knowledge representation, and neural networks. Since October 1990, acts as a senior research consultant for ILTC (www.iltc.br), with participation in research projects like: RECOPE – IA “Intelligent Systems for Engineering Applications”, financed by FINEP and coordinated by UFSCar, involving 11 Brazilian research groups in the area of Artificial Intelligence; and CLoP – “High Efficiency Systems for Constraint Logic Programming”, financed by CNPq and coordinated by UFRJ, among many others. Researcher of the Logic and Automated Reasoning Section in the Department of Computing at Imperial College. The Ph.D. studies were undertaken with the supervision of Prof. Dov Gabbay (now Professor in Kings College). The Ph.D. thesis, entitled: On Reconciling Conflicting Updates: A Compromise Revision Approach, proposed a method for handling logically conflicting inputs into knowledge bases in a compromised way. The proposed approach caters for the specific case where compromised solutions for revising knowledge bases apply, when conflicts involving updates occur. The method revises finite bases which are subjected to some integrity constraints, and performs a reconciliation of the conflicting data, by allowing the consistent logical consequences of the given up database elements or inputs, to update the database as a compromise. In comparison with approaches that require preference among conflicting inputs, or that avoid them by canceling them out completely, the proposed approach fits as an alternative which provides more informative results. During the time at Imperial College, participated also as an occasional research cooperator of the project MEDLAR “Mechanized Deduction in Logic and Automated Reasoning”, an ESPRIT European project on practical reasoning, involving over 15 major European research groups of the area. Joined the company SimTech Simulation Technology in Austria, in 1996. At SimTech, the work carried out concerns research and development of application software modules supporting computer-based simulations. SimTech is a company that provides state-of-the art tools and services for the analysis and optimization of energy systems. Based on several years of experience, it develops and markets software for design and performance analysis of energy systems and for optimizing plant operations. She is a founding member of the EURO Working Group on Decision Support Systems (EWG-DSS), which exists since 1989, since beginning of 2007 she integrates the Coordination Board and since beginning of 2011 she acts as Co-Coordinator of this Working Group. The EWG-DSS encourages the interest and cooperation of all researchers and members of the group to better interact as well as to have a better reach of their academic production within the various fields around Decision Support. 2012-2013: As expert in the area of Decision Support System, Fátima Dargam acts as project reviewer for the EC European Commission (Project TRIDEC). · Reviewer for the Elsevier JSS Journal of Systems and Software, in 2014. · Reviewer for the Taylor & Francis JDS Journal of Decision Systems, in 2014. · Referee and Guest Editor for the Springer LNBIP, Lecture Notes in Business and Information Processes, in 2014. · Organizer (together with the EWG-DSS Coordination Board) of the Decision Support Systems Stream of the IFORS 2014 Conference - The 20th Conference of the International Federation of Operational Research Societies, in Barcelona, Spain, July 13th -18th, 2014 (www.ifors2014.org). · Co-Chair from EWG-DSS (co-organizer together with the INFORMS/GDN Committee) of the GDN-2014 Conference - Joint International Conference INFORMS GDN Section & the EURO Working Group on DSS with Special Focus on Group Decision Making and Web 3.0, in Toulouse, France, July 11th -13th, 2014 http://www.irit.fr/gdn2014/ . · Organizer (together with the EWG-DSS Coordination Board; and with the EURO Working Groups EWG-ECUBE; EWG-MCSP and EWG-ORAFM) of the EURO Mini-Conference on “Collaborative Decision Systems in Economics and in Complex Societal and Environmental Applications”, held in Graz, Austria, October 17th-19th, 2013 (http://eurominiconferencegraz2013.wordpress.com/). · Project reviewer for the EC European Commission Project TRIDEC in Lisbon, in November 2013. · Senior Research Consultant for ILTC, Rio de Janeiro, Brazil ( http://www.iltc.br/ ). · Since 2012, project reviewer, as independent expert in the area of Decision, for the EC European Commission. · Since 2007, Co-Coordinator of the EURO Working Group on Decision Support Systems http://ewgdss.wordpress.com/ . · Referee for the JDS Journal of Decision Sciences in 2013. · Referee for the IJDSST International Journal of Decision Support Systems Technologies in 2013. · Referee for the Springer LNBIP, Lecture Notes in Business and Information Processes, in 2013. · Referee for the ITOR International Transactions in Operations Research in 2013. · Organizer (together with the EWG-DSS Coordination Board) of the Decision Support Systems Stream of the EURO-INFORMS 2013 Conference - The 26th European Conference on Operational Research, held in Rome, Italy, July 1st -14th, 2013 (http://euro2013.org/). · Organizer (together with the EWG-DSS Coordination Board) of the EWG-DSS Thessaloniki-2013 Workshop on “Exploring New Directions for Decisions in the Internet Age”, held in Greece, May 29-30, 2013 (http://ewgdssthessaloniki2013.wordpress.com/). · Organizer (together with the EWG-DSS Coordination Board) of the Decision Support Systems Stream of the EURO XXV Conference - The 25th European Conference on Operational Research, to be held in Vilnius, Lithuania, July 8-11th, 2012 (http://www.euro-2012.lt/ ). · Project reviewer for the EC European Commission Project TRIDEC in Luxembourg, in October 2012. · Referee for the IJDSST International Journal of Decision Support Systems Technologies in 2012. · Referee for the Springer LNBIP, Lecture Notes in Business and Information Processes, in 2012. · Organizer (together with the EWG-DSS Coordination Board) of the EWG-DSS Liverpool-2012 Workshop on “Decision Support Systems & Operations Management Trends and Solutions in Industries”. April 12-13, 2012, Liverpool, UK (http://ewgdssliverpool2012.wordpress.com/). · Organizer (together with the EWG-DSS Coordination Board) of the EWG-DSS / DASIG Paris-2011 Joint-Workshop. “EWG-DSS Stream on Collaborative Decision Making”. November 30th, 2011, Paris, France (http://ewgdssparis2011.wordpress.com/). 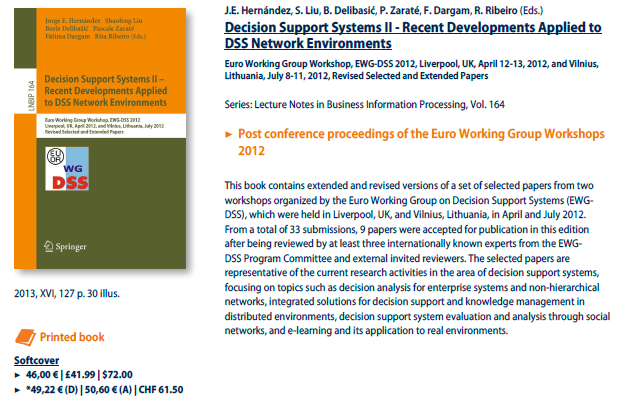 · Organizer (together with the EWG-DSS Coordination Board) of the EWG-DSS London-2011 Workshop on “Decision Systems”. Birbek College, London, UK. June 23-24, 2011 (http://londonewgdss2011.wordpress.com/). · Referee for the Decision Support Systems and Electronic Commerce Journal, Elsevier, in 2010. · Organizer (together with Pascale Zaraté and Rita Ribeiro) of the Decision Support Systems Stream of the EURO XXIV Conference - The 24th European Conference on Operational Research, held in Lisbon, Portugal, July 11-14th, 2010. (http://www.euro2010lisbon.org/). · Referee for the special issue on "Bridging the socio-technical gap in DSS - Challenges for the next decade", in , edited by Respício, A.; Adam, F.; Phillips-Wren, G. & Telhada, J., of the FAIA Frontiers in Artificial Intelligence and Applications, IOS Press, 2010. · Member of the Scientific Program Committee of the DSS-2010, the 15th IFIP WD8.3 International Conference on Decision Support Systems, held at the University of Lisbon, Lisbon, Portugal, in July 2010. · Referee for the Journal of Decision Systems (JDS), Hermes, in 2009. · Referee for the International Journal of Information Technology & Decision Making (IJITDM) in 2009. · Editorial Board Member and Referee of the International Journal of Advances in Soft Computing & Its Applications (IJASCA), ICSRS, since 2009. · Organizer (together with Pascale Zaraté) of the Decision Support Systems Stream of the EURO XXIII Conference - The 23rd European Conference on Operational Research, held in Bonn, Germany, June 5-8th, 2009 (http://www.euro-2009.de/ ). · Referee for the special issue on Technologies for Collaborative Decision Making, edited by Zaraté, P. & Respício, A., of the International Journal of Decision Support System Technology (IJDSST). To appear. · Referee for the ECIS2009, 17th European Conference on Information Systems, June 2009. · Referee for the European Journal of Operational Research (EJOR), Formal Tools and Methodologies for DSS, Elsevier, Vol.195 N. 3, 2009. · Referee for the Encyclopedia of Decision making and Decision Support Technologies, ISBN: 978-1-59904-843-7. Publisher: Information Science Reference, Idea Group IGI Global, Vol. 1, March 2008. · Invited talk about DSS and the EURO Working Group on Decision Support Systems EWG-DSS, at ILTC, Instituto de Lógica e Teoria da Ciência, Rio de Janeiro, Brazil, November 2008. · Member of the Editorial Review Board of the International Journal of Decision Support System Technology (IJDSST) since 2009. An Official Publication of the Information Resources Management Association . Editor-in-Chief: Pascale Zaraté, University of Toulouse, Toulouse, France. · Invited presentation about the EURO Working Group on Decision Support Systems EWG-DSS, in the opening session of the CDM’08 - International Conference on Collaborative Decision Making, Toulouse, France, July 2008. · Member of the Scientific Program Committee of the International Conference on Collaborative Decision Making (CDM’08) held at the Manufacture des Tabacs, in Toulouse, France, in July 2008. · Since 2007, member of the Coordination Board of the EURO Working Group on Decision Support Systems EWG-DSS, together with Pascale Zaraté and Rita Ribeiro. · Organizer (together with Pascale Zaraté) of the DSS - Decision Support Systems Stream of the EURO XXII Conference - The 22nd European Conference on Operational Research, held in Prague, Czech Republic, on June 8-11th, 2007 (http://euro2007.vse.cz/). · Referee for the EURO XXII Conference, Prague, Czech Republic, on June 8-11th, 2007 (http://euro2007.vse.cz/). · Senior Research Consultant for ILTC, Rio de Janeiro, Brazil (Instituto de Lógica e Teoria da Ciência). · Member of the Programme Committee of the CIDMDS-2006, International Conference on Creativity and Innovation in Decision Making and Decision Support, London, UK, June-July 2006. · Guest Editor & Referee (together with Pascale Zaraté) of the Special Issue on “Decision Support Systems: Methodologies & Applications” of the Journal of Decision Systems (JDS), Hermes-Lavoisier, Issue 2 / 2006. · Guest Editor & Referee (together with António Rodrigues) of the Special Issue on “Methods and Strategies for Decision and Management Problems” of the Central European Journal of Operations Research (CEJOR), Springer-Verlag, Issue 4, Vol.14, Dec.2006. · Co-editor of the “EWG-DSS Newsletter”, Communications of the Association of European Operational Research Societies - EURO Working Group on Decision Support Systems, since 2002. · Organizer of the 16th. EWG-DSS Meeting/Workshop, in Graz, Austria, within the Joint-Workshop on Decision Support Systems, Experimental Economics and e-Participation, on June 5-7th, 2005. (http://www.uni-graz.at/soowww/eCube). · Invited talk on “Intelligent Cooperative Decision Support Systems”, at the Department of Computer Science, University of Salzburg, Salzburg, Austria, April 2005. · Referee for the European Journal of Operational Research (EJOR), Elselvier, in 1997, 2001 & 2003. · Referee for the Journal of Decision Systems (JDS), Hermes, in 2002. · Vice-President of ILTC, Instituto de Lógica e Teoria da Ciência, Rio de Janeiro, Brazil, from July 1997 to July 1999. · Organization and Moderation of the Series of Seminars in Artificial Intelligence at ILTC, Instituto de Lógica e Teoria da Ciência, Rio de Janeiro, Brazil (1997-2000). · Invited talk on “The Development of Multimedia Systems in ILTC”, at the “Istituto di Cibernetica Eduardo Caianiello" – CNR, Naples, Italy, Oct. 1997. · Session-Chair in the 7th EURO Conference on Decision Support Systems, Groupware Multimedia, and Electronic Commerce, in Bruges, 1997. · Invited talk on “Decision Support Systems and Expert Systems”, at ILTC, Instituto de Lógica e Teoria da Ciência, Rio de Janeiro, Brazil, 1997. · Invited talk on “Supporting Decision Making via Compromise Revision”, at ILTC, Instituto de Lógica e Teoria da Ciência, Rio de Janeiro, Brazil, 1997. · Invited talk on “The Implementation of a Decision Support System within a Power Plant Design Environment”, at ILTC, Instituto de Lógica e Teoria da Ciência, Rio de Janeiro, Brazil, 1997. · Co-organizer of the “Third International Conference on Theorem Proving with Analytic Tableaux and Related Methods”, Abingdon, Oxford, U.K. May 1994. · Teaching Tutor for the Programming Languages Lab. Courses of the Computer Sciences Graduate Study at the Department of Computing, Imperial College, London, U.K. (1992-1994). · Seminars on “The OPS5 Language” & “Developing Expert Systems with OPS5”, as invited speaker of the CAVIAR - Advanced Course on Artificial Intelligence, promoted by Petrobras, Rio de Janeiro, Brazil, July 1989. · Professional Visits and Participation on the Autograph-Gerber CAD-CAM (Computer-Aided-Design & Computer-Aided-Manufacturing) Users Meeting, representing the Brazilian Navy Research Institute (IPqM), at Gerber Systems Technology, Connecticut, USA, May 1984 & July 1988. · Teaching experience as a “Teacher of English as a Foreign Language”, for basic and advanced levels, at the private English course CCAA (Centro de Cultura Anglo-Americana), Rio de Janeiro, Brazil (1978-1989). · Participation in seminars about Communication & Motivation; Team-Work & Cooperation; Cooperative Conflict Control; Project Management; Presentation Techniques; Time Management; Industrial Law; Visualization & Presentation. KISS Program, promoted by BFI-Graz & County of Styria, Austria, (2002-2004). · Participation on the 4th. European Summer School in Logic, Language and Linguistics. University of Essex, Colchester, Essex, U.K. August 1992. · Participation on the NATO-ASI Advanced Study Institute on Recent Developments in Decision Support Systems, promoted by the NATO Science Committee & Scientific Affairs Division. Il Ciocco, Italy, June 1991. · Participation on the IV EURO Summer Institute on Decision Support Systems, promoted by the Association of the European Operational Research Society. Madeira Island, Portugal, May-June 1989. · Course on Advanced Topics on Knowledge Engineering, promoted by IBM – ILAT Latin American Institute of Technology, Rio de Janeiro, Brazil, Jan. 1989. · Participation on the VI School of Computation, promoted by UNICAMP - Campinas University, Campinas, Sao Paulo, Brazil, July 1988. · Participation on the III EBAI – Brazil-Argentina Informatics School, promoted by SEI & UNICAMP, in Curitiba, Brazil. (Final exam results in 15th. place among 250 participants), Jan. 1988. · Computer-Aided-Design & Computer-Aided-Manufacturing (CAD-CAM) Course on Printed Circuit-Board Application, at Gerber Systems Technology, Connecticut, USA, May-July 1984. · Complete English Language Course at CCAA (Centro de Cultura Anglo-Americana) including one year of Teaching Didactics and English-&-American Literature, Rio de Janeiro, Brazil, (1970-1977). · Certificate of “Proficiency in English”, promoted by the University of Michigan English Language Institute, Ann Arbor, Michigan, USA, 1981. · Certificate of the “Test of English as a Foreign Language” - TOEFL (score: 600 points), promoted by the Overseas Institutional Testing Program, Princeton, New Jersey, USA, 1990. · German Language Course (basic levels) at the Goethe-Institute, London, U.K. (1991-1992). · German Language Course (basic and intermediate levels) at Urania, Graz, Austria, (1995-1999). · German Conversation and Writing-practice Seminars, promoted by the KISS Project, BFI-Graz, Austria, (2002-2004). · German Conversation and Writing-practice Course, promoted by the Institute LAIS, Graz, Austria, (2009).